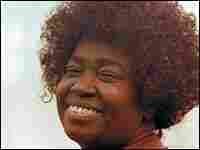 The Unmistakable Voice of Marion Williams Gospel great Marion Williams is not a household name, but she inspired many blues and rock singers. Little Richard's signature wail was all Williams. Her wide-ranging voice gave recording engineers fits, her long-time producer says. Unless you're an aficionado of gospel, you may not have heard the late singer Marion Williams. But you've probably heard her influence in the blues and rock 'n' roll. She inspired Little Richard's signature wail. Anthony Heilbut, Marion Williams' long-time producer, says she had a voice that's not easily forgotten. He's just released an anthology of her work called Marion Williams: Remember Me. "It was a voice of many colors," Heilbut tells Michele Norris. "Sometimes it was that of a rather melancholy young girl, other times the voice of a very worldly big mama. And occasionally, she would play both roles in one song -- sometimes in one verse." Among many acclaims for Williams, she received a Kennedy Center Honor and was named a MacArthur Fellow. She died in 1994, at age 66.